Beautifully crafted Spoon set in the shape of an Hamsa bird. Crafted in a stunning Gold color. - A Unique Cutlery Organizer Which Can Be Kept On Dining Table Or Dining Area. - Made Of Wood With Classy Finish. - Price Only For Bulk Orders Of 100 Pcs And Above. We are a leading supplier of many kinds of Cutlery Stand to offer to our valued clients. These stands are manufactured using skilful team & updated technology by using high grade stainless steel. We offer these stands in many shapes and sizes with beautiful designs. Our stands are highly durable & attractive in pattern. size in cm : 10 x 11 x 13 cm. We offer Cutlery Holder to our clients. 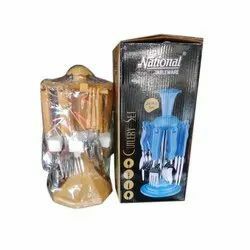 Amongst the chief organizations of this domain, we are occupied in providing to our clients wooden Revolving Cutlery Holder at very economical price. Size: 15", 17", 19", 21", 24"
To keep all cutleeery items neatly organised, this box cutlery basket is for you.